Russell Square platform on the Piccadilly line. It's one of the smaller stations, opened in 1906 so has lovely old green and white tiles. The Piccadilly line is a very deep line, at the station you either take the elevators or if you are feeling very fit, the 175 stairs. Although a sign warns you that taking the stairs is dangerous to your health. I'll let you decide on that one. This is the best stop to exit for The British Museum. You can easily see why this is called the tube! Wonderful lines and perspective. Mind the gap. Love the curved walls! Peter's right! The London Underground is unique. Why are stairs dangerous? Very cool! Someday I want to make a beaded Tube similar to this perspective! I love the London subway stations!! Hi Mo, welcome to the Subway Day Club! Great pic with this curve! Guess the danger in 175 stairs would depend on your direction of travel ... and your need for speed. A very "tubular" photo...Could you tell us why can the stairs be dangerous? Although I do not like elevators in underground stations much, I think I would do an exception in this case! Ciao. A.
I've walked up those stairs at least once and I doubt it was voluntary. Wow, I love the curve/lines in the photo. Yes, I've heard about how 'deep' underground London subway stations are. Also, I hear the trains do not have air-conditioning. Lovely photo and interesting text! There's something special with the London underground. Heathrow to Russell Square was the very first trip that I ever took on the Tube. It is a great little stop. I definitely don't miss this. Great longshot. I always enjoy travelling on the tube. It's not always comfortable, but it's got something intimate to it, even when it's very crowded. That's why I like this picture. You can post some more tube shots as far as I'm concerned. I am fascinate by the subway and enjoy these photo series. Our city does not have a subway system. This is a wonderful blog. I'm an anglophile who's never been but still plans to go. 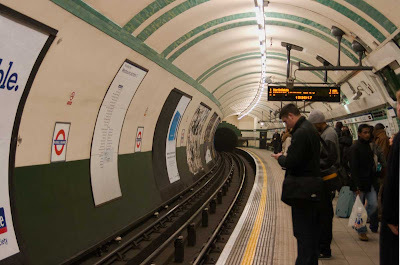 Anyway, I set the Russell Square tube platform as my desktop background, I liked it so much. Thanks. Great Bog, I really like the fresh take! I enjoy your photography. I have recently been viewing more blogs than usual, I am trying to start my own. Congratulations on being a blof of note by the way. london tube is really really nice, and i am happy can see it again from your photography. interesting picture - what camera and lens are you using? i'd love to be able to see london someday. was able to go around continental europe about twelve years ago but haven't been fortunate to cross to the isles. nice blog, thanks for sharing london! Last friday, i vivsted all 270 Tube stations, in the time of 18 hours and seven minutes. Quite exciting and the first time I'd seen Epping and many of the stations. I love the green of the tiles! Brilliant photo and post. Nice blog, love the pictures. Awesome tunnel. I ride the train in San Francisco... mine's not that cool. Your experience visiting every Tube station in one day is fantastic. Many would call it crazy but I'd love to duplicate your feat. Sounds like it would make a great magazine article.. Cool shot. Congrats on being a blog of the day! The stairs are bad for your health? Taking the tube is bad for your health. Just look at your black snot afterwards. Why is it black? it's because there is no clean air and you are breathing in other people's dead skin cells when you get crammed together. Mmmm black snot! Gee, thanks for the snot comment, Shara. I have this photo saved as my background, I like it so much. Now I've got something disgusting to think about everytime I see it. I love the subway pic. I would think that taking the stairs would be good for your health! Trust me, 18 hours has never felt so long in my entire life. On the upside very few people have achieved this, and glad to be part of that group of people. Congratulations, CSouthwell, on joining the rare group of London Underground junkies. All I can say is I've spent several hours riding the buses in Little Rock. Not for fun or glory though, I assure you. London is beautiful and diverse, from people to architecture. Thank you for sharing your journey.